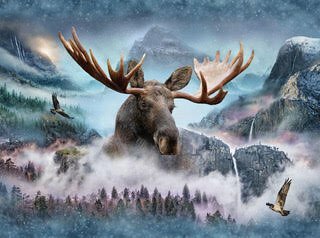 Hoffman Spectrum Digital Panel # 239 Waterfall/Moose Q4428 449 - Moose in Call of the Wild line. 100% cotton. A Hoffman Spectrum Digital print. Continuous panel design with repeat approx. 43″ x 33″ wide.